Robert and Bernice Leekya have been making traditional jewelry at Zuni Pueblo for five decades. Characterized by hand-cut stones, their work consists of bracelets, bolo ties, belt buckles and more. Now advanced in years, their production has dwindled to a mere trickle. Bernice is the sister of Alice Quam (now deceased), who was also known for making fine cluster work in the classic style. This is a manta pin; large and strong enough to attach a shawl at the neckline so one needn't clutch it to keep it over the shoulders. When you see large Kingman cluster bracelets of the sort that Robert and Bernice make, you may well see the woman wearing a manta pin as well and, perhaps, big matching cluster rings on one or both hands. This sort of thing is passed from mother to daughter and might be kept in pawn to keep it safe until special feast days come around. The stone, which is natural, untreated Kingman turquoise from Arizona, is perfectly matched because all of the individual stones are hand-cut from the same piece of rough rock turquoise. It is a low-profile cut with a soft dome and the stone is flecked with black matrix here and there. 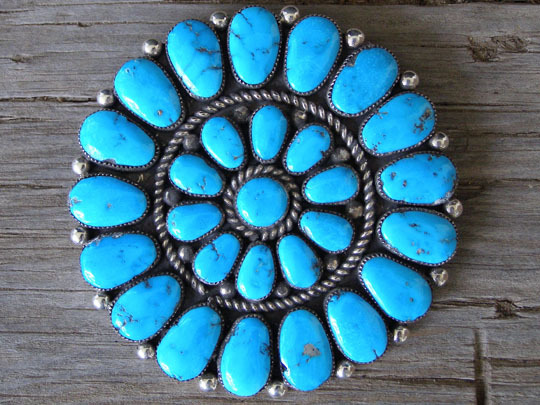 This is the type of turquoise most sought after by native peoples of the Southwest and whether you are at Santo Domingo Pueblo for a feast day, or at a Navajo or Zuni gathering, you will see women of status wearing this type of jewelry. The golden years for production of these bracelets was in the sixties and seventies, but very few of the original makers are still living, let alone still producing jewelry. The cluster consists of sixteen egg-shaped stones forming the outside edge, while ten smaller egg-shaped stones surround the center round stone. Heavy-gauge twist wire and raindrops add sparkle to the design and reinforce its visual symmetry. A pin mechanism on back gives a full 1 3/4" to pierce a thick fabric and hold this heavy pin. Hallmarked RLB on back with the center L for Leekya twice the size of the R and B for Robert and Bernice. Also stamped Sterling on back.